A method of evaluating a person’s swallowing ability by means of a video-documented physical examination, looking from inside the throat. Also called the fiberoptic endoscopic evaluation of swallowing (FEES). The videoendoscopic swallowing study (VESS) is to be distinguished from the videofluoroscopic swallowing study (VFSS), which is an x-ray-based assessment. 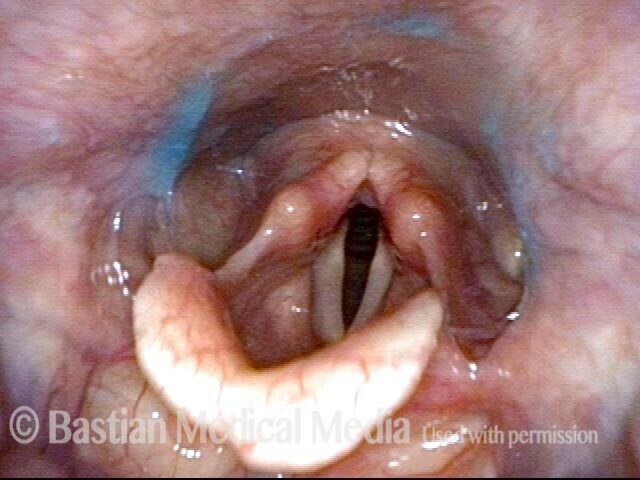 To perform a VESS, a clinician uses a fiberoptic or distal-chip nasolaryngoscope. The clinician begins by examining the structure and function of the patient’s palate, tongue, pharynx, and larynx, including sensation, if desired. Next, to assess the patient’s swallowing capabilities and limitations, the clinician positions the tip of the nasolaryngoscope just below the nasopharynx and, looking downward into the throat, asks the patient to swallow a series of colored substances with a range of consistencies (e.g., blue-stained water, blue-stained applesauce, and orange-colored crackers). As the patient swallows these substances, the clinician watches to see if any significant traces remain in or reappear in the space above, around, or within the larynx, rather than disappearing into the entrance to the esophagus. If significant traces remain in view, or if any material spills into the opening of the larynx or down the trachea, the patient may have presbyphagia. If significant traces initially disappear but then re-emerge upward from the esophageal entrance, the patient may have cricopharyngeal dysfunction, with or without a Zenker’s diverticulum. This method has particular value for patients who are bedfast and cannot travel to the radiology suite, or for patients whose swallowing function is rapidly evolving (improving, usually), such as those recovering from a mild stroke. For clinicians experienced with this technique, VESS can also often be used with new patients complaining of dysphagia during the initial consultation as a robust and—depending on patient history—potentially stand-alone method of diagnosis and management. Sometimes, the VESS findings, along with a patient history of solid food lodgment at the level of the cricoid cartilage or cricopharyngeus muscle, will indicate when VFSS should also be obtained to assess for possible cricopharyngeal dysfunction. Even in this latter circumstance, when VFSS is called upon to confirm a suspected diagnosis, VESS will have already oriented the examiner to the nature and severity of the problem. In most follow-up circumstances other than after cricopharyngeal myotomy, VESS is generally more efficient and inexpensive than VFSS. This man has symptoms of cricopharyngeus muscle dysfunction (CPD), with frequent lodgment of solid food (never soft or liquid material) at the level of mid-to-low neck. This VESS sequence demonstrates his propulsive or “pitcher” ability. Here in VESS part Ia, palate elevates normally (arrows). Left palate is not drooping and there is no deviation. In Part Ib of VESS, the patient makes voice, to prove normal movement and good closure of the vocal cords. 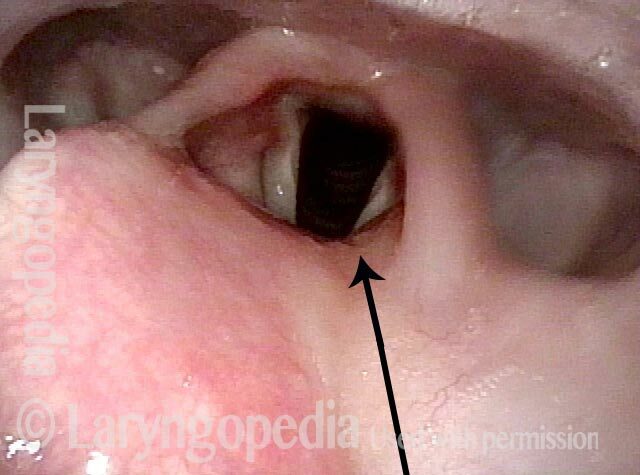 In addition, no secretional pooling is seen in vallecula or pyriform sinuses. Part Ic: Very high pitch is elicited. Pharyngeal walls contract inward (arrows), closing the pyriform sinuses. Part Ia,b, and c (Photos 1, 2, and 3) verify that there is good function of swallowing equipment, i.e. palate, pharynx, and larynx (and tongue). Part IIa: Blue-stained applesauce is first, because puree is the “easiest” material for the majority of patients, whatever their diagnosis. Here, one sees only minimal residue after several boluses are swallowed. ...on the pharyngeal walls (arrows). Part IIc: After several boluses of blue-stained water, all cracker is washed away and there is no blue staining or residue within the laryngeal vestibule, subglottis, or high trachea. Given this man’s CPD symptoms, VFSS may show a cricopharyngeus muscle bar, indicating incomplete relaxation of the upper esophageal sphincter. This view is a moment after a completed swallow of blue-stained applesauce. Same view, a second later, as blue-stained applesauce emerges from the Zenker's diverticulum upward (toward the camera) into the postcricoid area. Another second later, applesauce continues to re-emerge into the hypopharynx. The patient has swallowing problems typical of cricopharyngeal dysfunction. This swallow study reinforces that impression as well as the likely presence of a Zenker's diverticulum. In this photo, blue-stained water has just been swallowed, and the vocal cords are beginning to open. At this point, the hypopharynx contains no residue. One second later, the blue-stained water begins to emerge from just above the cricopharyngeus muscle into the "swallowing crescent". Another two seconds later, the larynx has fully opened post-swallow. The post-swallow hypopharyngeal re-emergence of the blue-stained water is apparent. 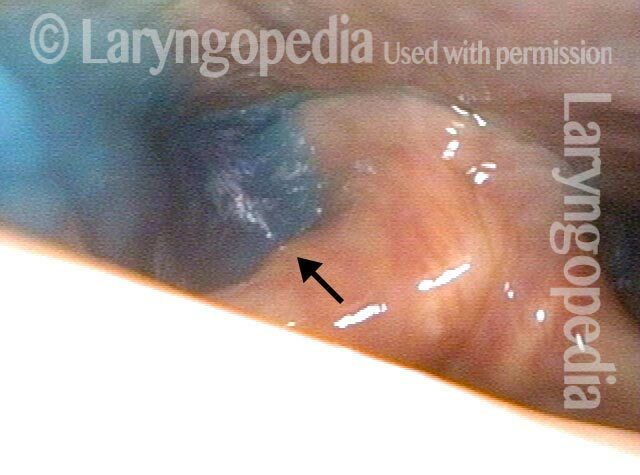 After the patient swallowed several boluses of blue-stained applesauce, there were traces visible on the laryngeal surface of the epiglottis, indicative of penetration into the earliest part of the airway. By itself, soiling of the laryngeal vestibule to this minor degree does not threaten the person’s ability to eat by mouth. This middle-aged woman has had a known Zenker’s diverticulum for several years. She has now reached a point of frustration that has motivated her to proceed with cricopharyngeus myotomy. The series that follows explains some of the reason for her frustration. In this view, the patient has just completed a swallow of her saliva. 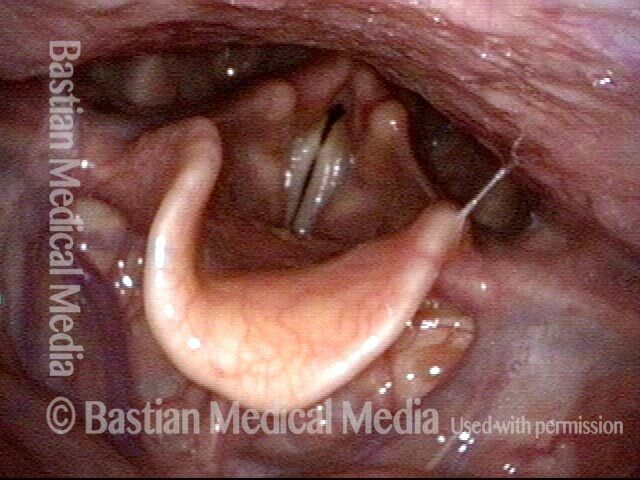 A few seconds later, saliva begins to return upwards into the post-arytenoid area (at arrow) from the Zenker’s sac. Less than a second later, more saliva comes upward from the Zenker’s sac. A few seconds later, sufficient saliva has welled up from the sac that the patient is forced to re-swallow, taking her back to the appearance of the first photo in this series, only to begin the same cycle depicted in these four photos again and again. This older woman swallowed a pill that lodged low in her throat. In spite of repeated swallows and attempts at expectoration, she couldn't move it for many hours. On examination a few days later, this superficial ulceration is seen due to mild chemical burn. Note as well the redness of the left arytenoid and pyriform sinus (right of photo). 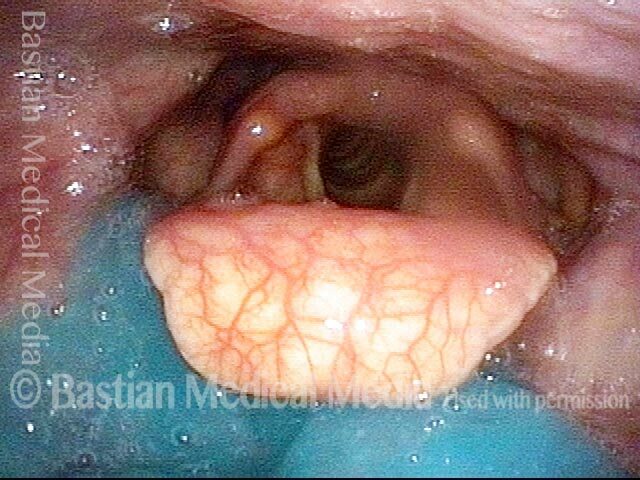 At closer range, while having the patient perform a trumpet maneuver, a well-demarcated superficial ulcer is seen again. 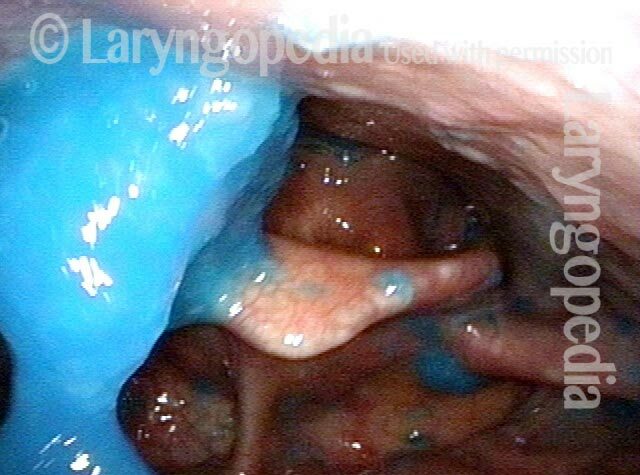 Administration of blue-stained applesauce during VESS shows that a partial reason for lodgment may be reduced propulsive strength, indicated by pooling of material in the vallecula. After sips of blue-stained water, note the fairly organized crescent of pooled water in the pyriform sinuses and post-arytenoid area. This can suggest a functional outlet obstruction caused by incomplete relaxation of the cricopharyngeus muscle (CPD). During VESS, blue-stained applesauce falls down to the posterior base of tongue. If the swallowing reflex were normal, the patient would have swallowed before the applesauce arrived here. 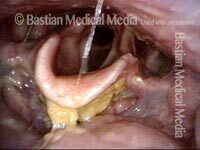 Because of the viscosity of the material it "hangs" for a moment and does not fall down into the entrance of the larynx. Even with a delayed swallow reflex, there is still a second or two to swallow before that happens. The patient will tend to cough less with this consistency than with water. Here, blue-stained water is flowing into the right pyriform sinus (left of photo at arrow). Movement is rapid (note the blur) due to the low viscosity of water; there is less time to react and swallow than with applesauce, explaining why coughing on water is more common than purée or solid. 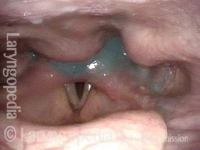 Still, at the end of several boluses of applesauce and water, stained with blue food coloring, there is no stain or residue inside the entrance of the airway. The delayed swallowing reflex is a liability but without a risk of pneumonia. Step 1 is assessment of the patient's swallowing "equipment." 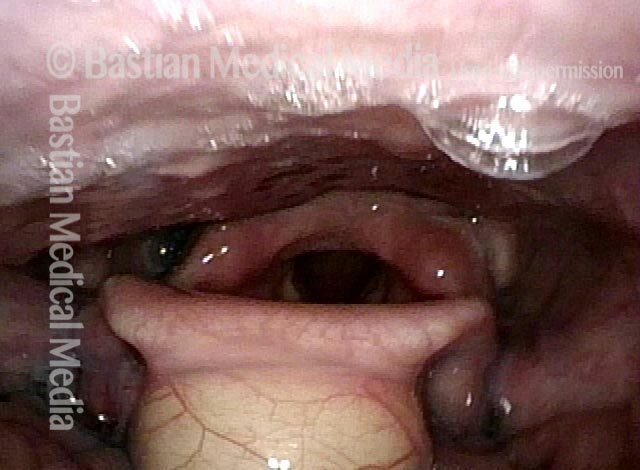 Here we see that the palate elevates symmetrically against the posterior pharyngeal wall. 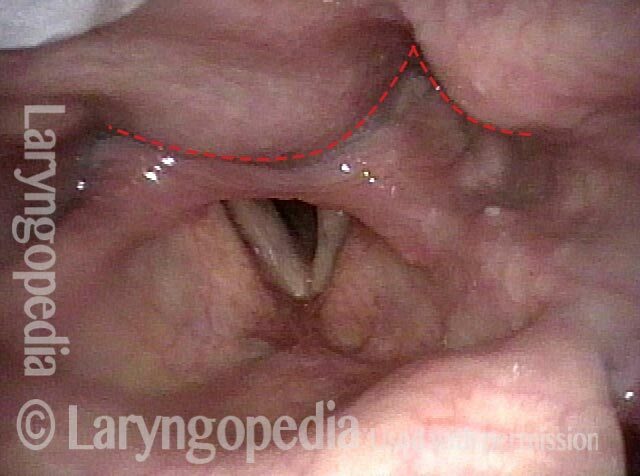 The next step is to observe the pharynx squeeze with inferior constrictors bulging to surround the larynx. The vocal cords close fully. Next is the assessment of patient secretions. This hypopharyngeal pooling of saliva (foamy bubbles) predicts that there will be similar pooling of swallowed food materials during the next step of VESS. As predicted, blue-stained applesauce (purée consistency) pools in the pyriform sinuses. There is no laryngeal soiling (penetration, aspiration). The next test is the cheese cracker (solid consistency). After swallowing, the residue is seen especially in the vallecula. After several boluses of blue-stained water, a small amount remains in the pyriform sinuses and post-arytenoid area. This 95 year-old man has large cervical osteophytes (bony proliferation due to arthritis). These osteophytes protrude into the pharynx (dotted lines). It would seem they would be a major impediment to swallowing. After an initial test swallow, eight boluses of blue applesauce are administered rapidly. The purpose of this is to serve as a “stress test” so that we see his swallowing at its worst…But he has only a small amount of residue, and passes the test. Most individuals with cervical osteophytes are of advanced age. When swallowing is impaired, the explanation is usually more than just the osteophyte. After several boluses of blue-stained applesauce, there is significant pooling (residue), but nothing down at the level of the vocal cords. After chewing and swallowing a cheese cracker, a part is lodged in the vallecular. 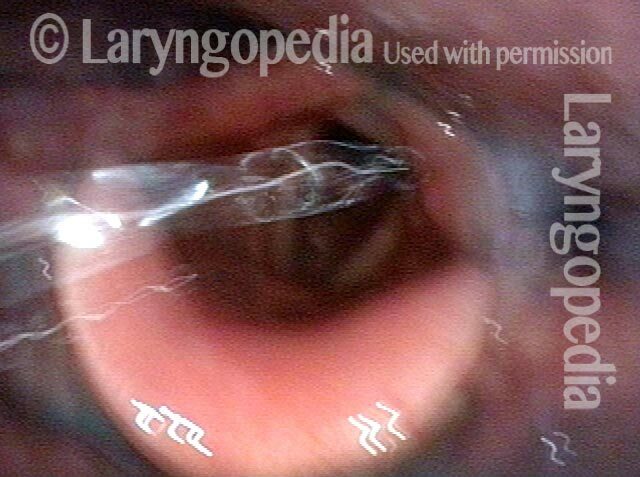 During administration of blue-stained water, a large drip is seen falling downwards, directly into the laryngeal vestibule. A moment later, a cough sprays the aspirated blue-stained water upwards and out of the airway. This video features an example of a 100-year-old patient undergoing VESS.